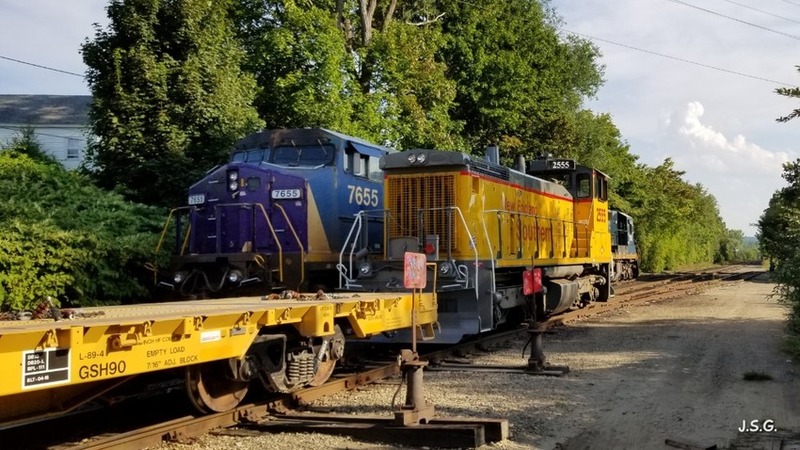 The job for the 2018 NH Military Train was completed in Canterbury. New England Southern was bringing the last cut of empty flat cars to Concord for Pan Am to take them south. The empty cars were left on the active portion of the Northern, the White Mountain Branch, the Team Track, and the Yard Track 10 stub in Concord. Pan Am's NA-2 Crew gathered up all the empty flat cars and went south later that evening. The new-to-them six axle Pan Am "Big C's' stashed in Concord was about as rare of a sighting as it gets. Here NEGS SW1500 passed PAR's stashed C40-8W and standard cab C40-8 by the yard tower in Concord. Photographed by Jay Gadon, August 29, 2018.